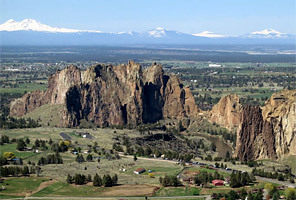 Smith Rocks, located in central Oregon, is one of the best locations in the Pacific Northwest to learn how to rock climb. Touting some of the hardest rock climbs in the U.S. it is also a great place to begin setting your sights high. Our certified and trained (American Mountain Guides Association) guides will make sure that you are able to progress at your own speed. In Spring and Autumn when the infamous Northwest rains are falling, the eastern side of the Oregon Cascades offers routinely good weather. Smith Rocks provides a beautiful and scenic setting. The easy access to the crags makes this a great place to "get down to work" and the nearby town of Bend is a great place for us to relax and enjoy good dinners and talk about the day's triumphs. These seminars are an excellent choice for those considering participation in climbs that require confidence and efficient movement over rocky terrain. Focusing on the balance and technique necessary for climbing steep rock gives one a real advantage on expeditions that require the ability to move swiftly and confidently on technical terrain. Upcoming IMG expeditions for which this seminar is useful training include The Matterhorn, the Alps Classics program, climbs in Washington's North Cascades and any other ascents that include rock climbing. This program is a great introduction to traditional rock and sport climbing. The focus of the seminars will be on improving individual climbing skills. With a small instructor/student ratio there will be lots of close attention for all levels of climbers. Participants are encouraged to progress at their own pace and comfort level. No previous rock climbing experience is required. Guides are available for coaching all levels of ability. Sign up for the three-day or the five-day course, and come have a great time with us! To make your life more enjoyable we are available before the climb to discuss proper training for the seminar. Come climb in Smith Rocks with IMG's world renowned guide staff. IMG is accredited by the American Mountain Guides Association. Your lead guide in Smith Rocks will be at minimum an AMGA Certified Rock Instructor. International Mountain Guides leads climbs in Smith Rocks State Park under permit from the Oregon State Marine Board. 3 and 5-Day Seminars are custom climbs. Please contact us to arrange dates.